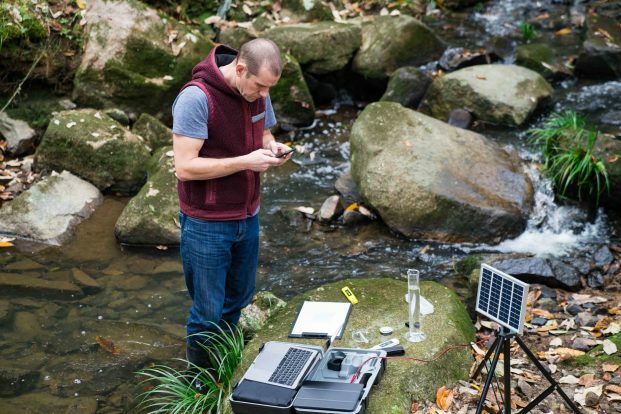 Scalable data access is a pressing problem for environmental monitoring and decision-making. Sensors and data sources provide large amounts of structured data, text, pictures and videos. These are spread across many databases and Excel spreadsheets. The environmental scientist has the same data access challenges as an oil & gas engineer. For this reason we are working with leading environmental researchers like CIRFA and NIVA to solve data access and data science challenges. The CIRFA Centre for Integrated Remote Sensing and Forecasting for Arctic Operations, based in Tromsø, is another of the Research Council’s Centres for Research-based Innovation. Its aim is to develop new and better ways of observing the environment in the Arctic; this being a prerequisite for safe industrial operations in this area. SIRIUS has had cross-domain activities in the Arctic Earth Observation in 2016 and 2017 through a collaboration with the CIRFA. Equinor is partner in both CIRFA and SIRIUS, and was instrumental in setting up this collaboration. In 2018 SIRIUS and CIRFA worked on submitting a Marie Curie proposal, that was unsuccessful, but that formed the basis for CIRFA participating in a successful Horizon 2020 proposal later in the year. This project is coordinated by Manolis Kourabakis from National and Kapodistrian University of Athens, who is a long-term collaborator with SIRIUS. In addition, CIRFA has recruited a PhD fellow, who will be jointly supervised by Einar Broch Johnsen from SIRIUS, will work on efficient cloud deployment of the CIRFA pilot applications. 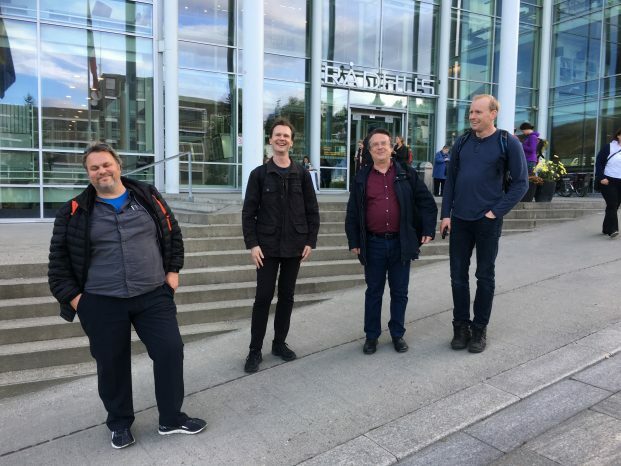 Einar Broch Johnsen, Rudi Schlatte, Manolis Kourabakis and Dag Hovland in Tromsø for the SIRIUS-CIRFA workshop in September 2017. Remote sensing and forecasting produces large amounts of data in many formats. Satellite and aerial pictures and radar images are an important primary source of information. However, unstructured data like reports is also important. Processing, modelling and forecasting can consume large amounts of computer power and require intelligent management of data and results. CIRFA’s Work Package 7 has the ambition to develop a pilot Integrated Remote Sensing Service, that will allow oil companies and other interested parties to use data for daily decision support in their applications. As noted above, SIRIUS and CIRFA share a common partner company, namely Equinor. Discussions between Equinor’s contacts, CIRFA and SIRIUS suggested that SIRIUS may be able to provide research-based IT solutions that could improve the performance and usability of the CIRFA pilot. An initial meeting was held in Tromsø in June 2017. This meeting identified two areas where SIRIUS and CIRFA could work together. The first was in cloud deployment. The CIRFA pilot will use simulating and processing components produced by CIRFA researchers and deployed on a cloud computing platform. Ensuring good resource use and reliable performance is non-trivial. SIRIUS’ tools and methods for analysing and designing complex distributed systems could be of use. The second area was around data management. SIRIUS’ work in ontology-based data access could improve the sustainability and usability of the CIRFA pilot. Scalable data access is a challenge in many environmental applications. Observations and measurements take many different forms and are spread across many different databases. This situation is the same as that faced by engineers in the oil & gas industry. For this reason, we are collaborating with NIVA, The Norwegian Institute for Water Research, to explore how semantic integration and ontologies can improve data access and the quality of decisions made in environmental toxicology. A NIVA stipend holder, Erik Bryhn Myklebust, works with SIRIUS and is supervised by Professor Martin Giese.